Orchids are amongst the most beautiful and rarest of our British wild Flowers. Many species are sadly in decline and several species such as Ghost orchid are now extremely rare and are confined to a very small number of sites. Luckily it is still possible to see and photograph many of the orchid species found in Britain. The exact number of orchid species in Britain is a variable number and depends on if sub species or possibly extinct species are counted, but the number is between 55 and 60. I have so far seen and photographed around 25 species and hope to increase that number in the future as time and opportunities allow. 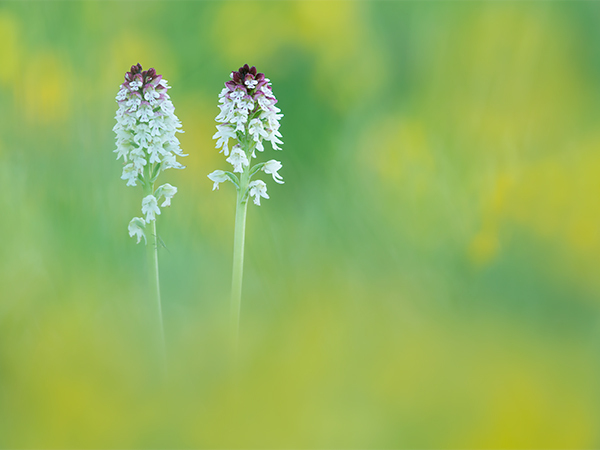 A pair of Burnt Tip Orchids in a field of Buttercups, image taken in Wiltshire.